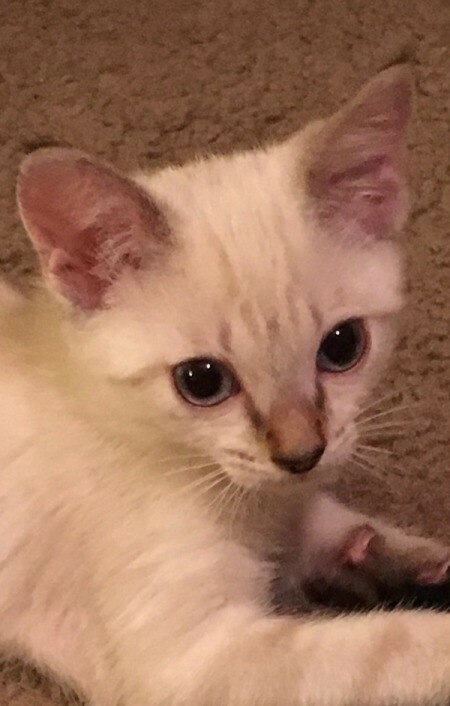 Siamese mix with beautiful light ice-blue eyes, caramel streaks on super soft, cream colored fur. His tail is like a gray/brown racoon's tail. As a kitten, he's a great eater and sleeper. He loves all toys. Most of all he loves to snuggle in my arms or under my chin. His middle name is Skippyjon, based on a childrens' book series (Skippyjon Jones). It is about a naughty but curious, sweet Siamese kitten who pretends to be a great sword fighting Chihuahua. He is mistaken for this dog breed because his ears are too big for his body! I remember the book - neat names. I always like to remind people to be sure and take their precious babies to get their first year shots as they can get sick so quickly from some of the things floating around us.